Do you ever start a project thinking it will take you 15 minutes and is a piece of cake, only to have it snowball into an hours-long tortuous undertaking that leaves you questioning why you started the project in the first place? I feel like this pretty much sums up the majority of the projects I take on. “Hey Ben! 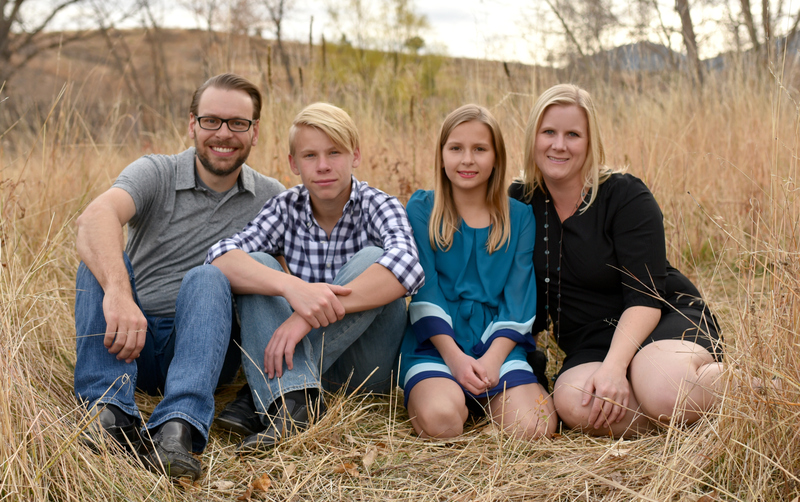 Will you help me really quick with this small project? It will only take about 15 minutes.” Famous last words. 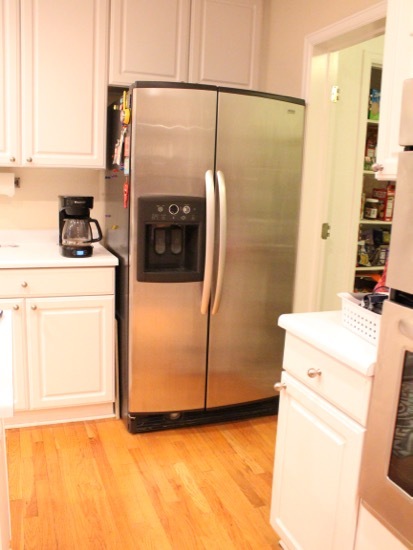 This kitchen came with the lovely stainless steel side-by-side fridge you see in the back corner. SWEET! 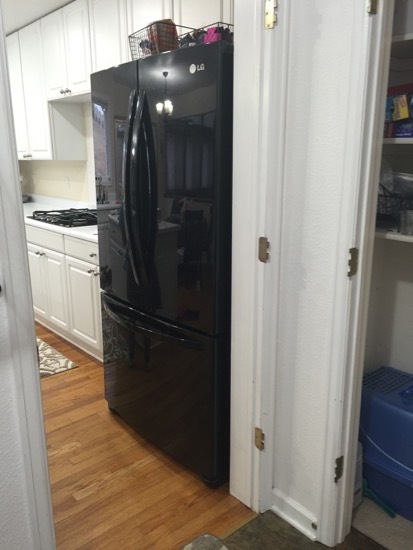 A free fridge with the house! Now we can put our other fridge in the garage for sodas! Not so much. 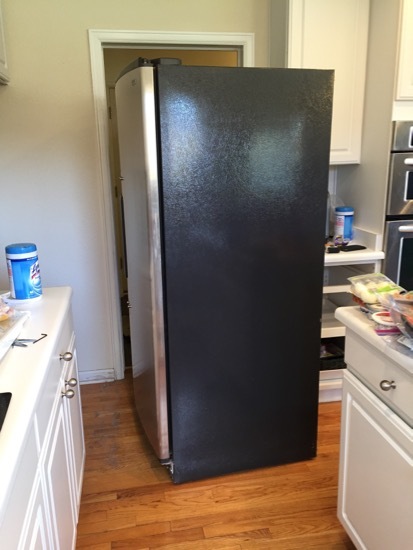 After a few months of living with this side-by-side fridge, I hated it. It works just fine, but the side-by-side door situation was driving me crazy. I prefer the freezer-on-bottom style fridge. Also, there were a few drawers inside that were broken. So we decided to switch out the fridges. Easy peasy. All we had to do was bring in ours from the garage and swap them out. 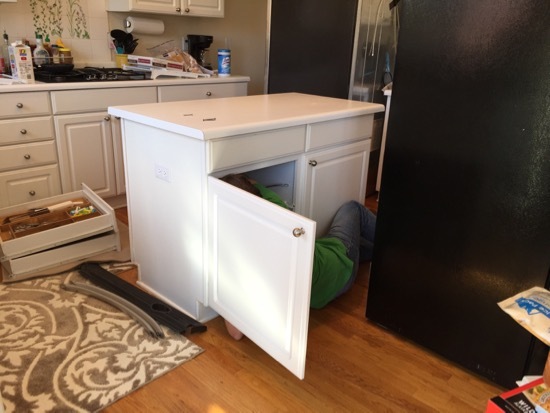 Pulling the old fridge out of the fridge hole was easy enough… We even brought in the new one and had it ready to go. But guess what? 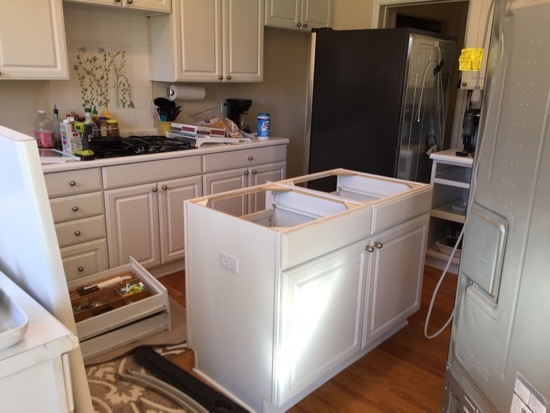 Neither fridge would fit between the counter and the island. They wouldn’t fit through the doorway into the laundry room either. Womp womp. We could have taken the doors off the fridges I guess, but they have water lines hooked up to them, and it just seemed like a big pain in the you-know-what. (We did take the door handles off though). So after some cursing, we realized if we took the countertop off the island it would give us just enough space to squeeze the fridges in and out. Finally! Our trusty fridge that we’ve had for 5 years, installed in our kitchen. I gave it a hug. I sure love how spacious a french door fridge is. 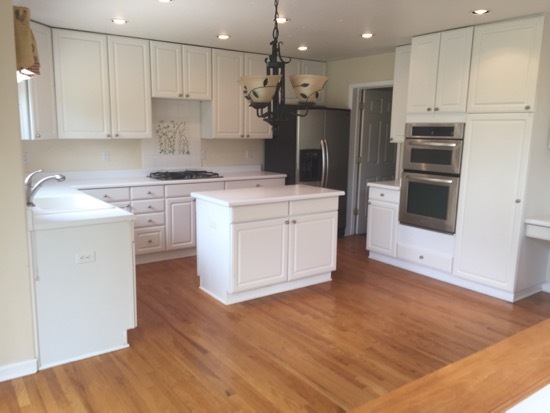 When we finally decide to tackle a kitchen renovation in this new house, you can be assured that the island width will be taken into consideration for things like appliance installation and traffic flow. So glad to have my fridge back, but wow, why do all these seemingly easy projects have to be so hard?! I didn’t even though you could take the counter off without demolishing it! Fortunately ours wasn’t also glued down – only screwed down. **know. I didn’t know you could do that! When we had this issue we had 5 friends come over and lift it over the counter- no way was I taking of the countertop! This is my life!! Replacing our kitchen sink, easy job right? NO! They cracked the granite composite sink while trying to punch out the holes for the soap dispenser. Had to put the stainless sink back in and order a new sink. Why oh why can’t anything be as easy as it sounds? 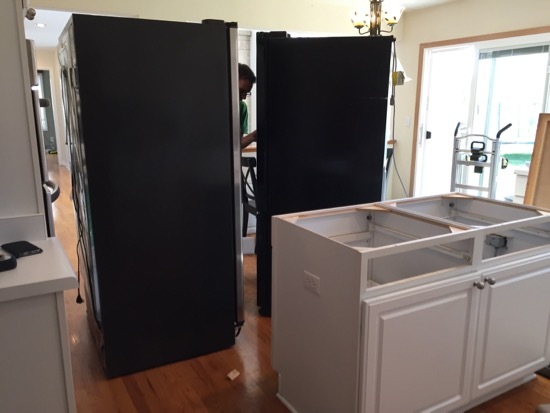 We had to take the doors off our fridge to get it out to install the new one. Water lines and all had to be disconnected. I swear, every project I tackle ends up being a pita! All that aggravation was well worth it! 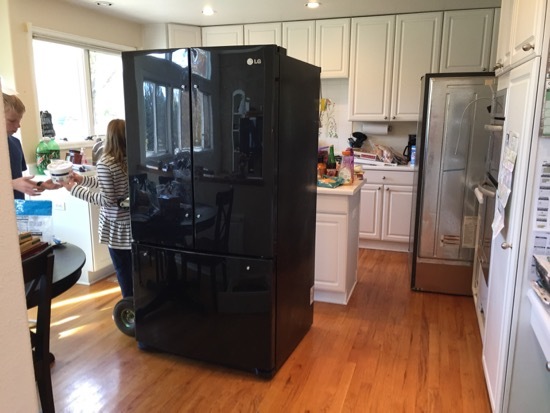 I’d do it too, to replace a side by side with a french door fridge. I love mine. Thanks for writing about the normal things, things that don’t always go perfectly. LOL! We had the same thing happen, only it was with our water heater. We had to take the door off AND the framing around the door to swap out the water heaters. I think this is more common than one would think. I’ve removed door with the water lines, handles and eventually a section of a pony wall to get a new larger frig installed. I bet the sellers decided it was easier to leave that frig than fight it to remove. On this subject Allison have you had the frig leave indentions in wood floors? I did previously but learned when appliances were delivered to my new home there are things called “skids” that the delivery service uses to not damage wood floors. And they used two so the bottom skid never moved so ensure that tiny debris under the skid doesn’t scratch the wood. The top skid moves the heavy appliance into place. It was genius! I’m going to buy one to have for use here at the house. Holy cow! How aggravating! 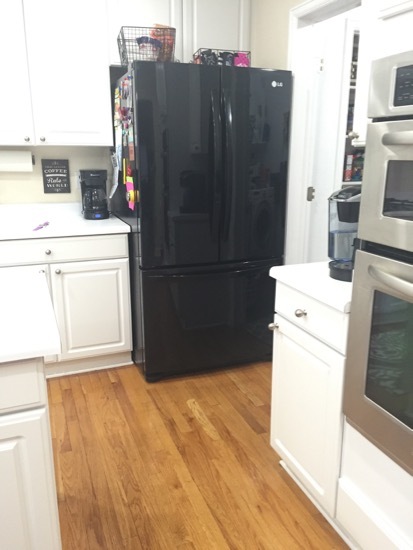 Maybe I like my rolling island after all… I love my french door fridges too! I need SPACE! What a creative solution! I never would have thought to remove the countertop. We’ve been having refrigerator drama for well over a year. Our current refrigerator’s ice maker died two years ago, the drawers are falling apart, and our handyman identified that the wiring is ocasionally overheating, which is a fire hazard…yay! BUT, the upper cabinets are so low that we can’t fit most french door models. And it just snowballs from there. So glad you didn’t have to deal with that type of drama. And, 15 minutes is never 15 minutes!